Depeche Mode’s gig at the London O2 illustrated something that fans perhaps do not often think about, as they wave their arms and sing the songs. Musically, visually, as a group of musicians – Depeche have always been a band of contrasting elements, both strange and complicated. And, yet, 37 years into their career, the 2017 incarnation of Depeche Mode is at peak levels of contradictions, everywhere you look. These disparities are not to their detriment, they are what make Depeche Mode, the individuals, the band – the phenomenon, even – what they are. They are what have lured 20,000 people to a sometimes soulless arena in South East London, again (there will be millions by the end of the Global Spirit Tour in July 2018). They are what drive the fans to buy the reams of merchandise and the multiple formats of albums and singles. And, most importantly, such contradictions are perhaps what continue to inspire the band to create music. But why does the Spirit “era” feel different? 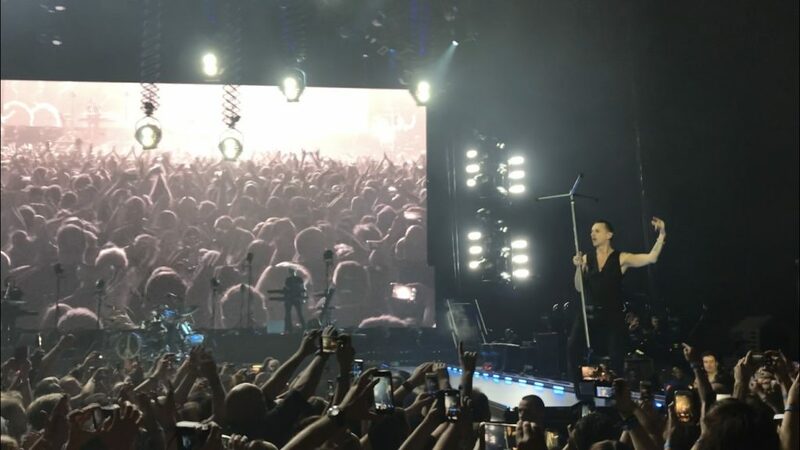 After five gigs this year – the London O2 show was my final one for 2017, perhaps for the entire tour – it feels as if there’s a different mood in the elements that make up the world of Depeche Mode. It started in March this year. After a fairly formulaic introduction to the band’s return from their traditional hiatus between long-players (a press conference a few months before, a single release for Where’s The Revolution, followed by the album release for Spirit), fans could perhaps be forgiven for thinking the Spirit segment of their history would be fairly similar to those that proceeded it. Single-album-tour-single-tour-single-tour-single-tour, etc, sprinkled with some reasonably benign press coverage featuring the same old questions each time. But then the album started getting some good reviews in the music press and, better still, the band’s biggest and fiercest critics (i.e. the fans) seemed to be getting behind it. “Best work since Ultra“, “better than anything Hillier ever did with them”, “found their musical mojo again” – you get the idea. It’s not worth debating here where Spirit ranks in the catalogue (personally, it’s the strongest album since the underrated and vastly different, in terms of tone, Exciter in 2001), but the general reaction to it perhaps triggered something in the minds of fans and the band. The interviews to coincide with the album launch were some of the best they’ve done in years (Andy Fletcher in Ireland’s Hot Press and this terrific one-hour podcast with Dave Gahan for Nerdist are two particularly good ones) and – here’s one of those contradictions – they sounded incredibly happy about being Depeche Mode again. Yes, despite the album’s gloomy take on the world we live in, and life in general (! ), written almost in despair at times, the trio seemed to be in anything but a state of melancholy. A few TV promos in Germany and France showed the band were in good shape (Christian Eigner and Peter Gordeno in tow for now pretty much their 20th year), and then Depeche Mode went to Glasgow. The performance in the city’s Barrowlands venue, headlining the BBC 6Music Festival in front of barely 1,500 or so fans, will probably become a legendary gig for many reasons, not least for those that were there, but most importantly it showed the outside world (it was broadcast live and then found on YouTube within days) how good new songs such as Cover Me could sound live, how much fun Gahan seemed to be having, and a reminder how uplifting the band can be. Eight months on from that night in Glasgow and they’re back in London for a solitary show, ending a four-night jaunt through Ireland and the UK before heading to Europe for a few more months either side of Christmas. The London Stadium gig in June was an event, not a gig. For many fans, it was a landmark moment, proving to the UK music scene, press and public, that they genuinely are one of the biggest bands on the planet. It was a Rose Bowl moment, just for the locals. 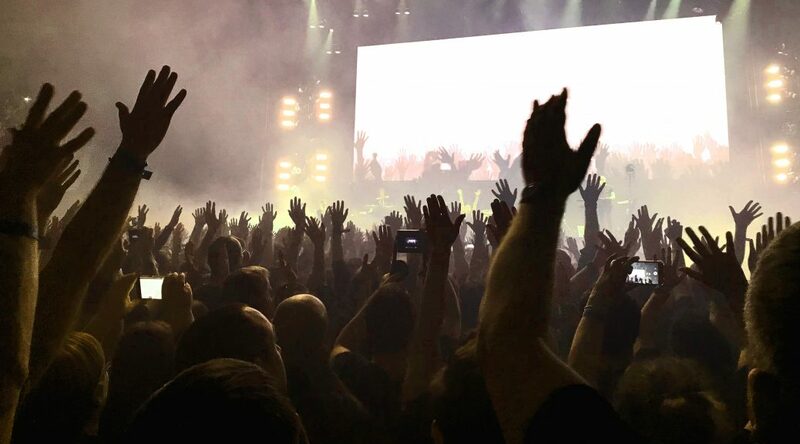 But the O2 is more natural territory for Depeche Mode – indoors, dark, tight-knit crowd (although the venue is still vast), intense, controllable. The crowd feels different tonight. There’s an overwhelming, celebratory vibe in the air, something that’s always there to some degree at gigs but not this intense. Here comes another contradiction. By the time set opener Going Backwards is in full swing, thousands of people are gleefully singing about “piling on the misery” and “we feel nothing inside” – it’s utterly wonderful. 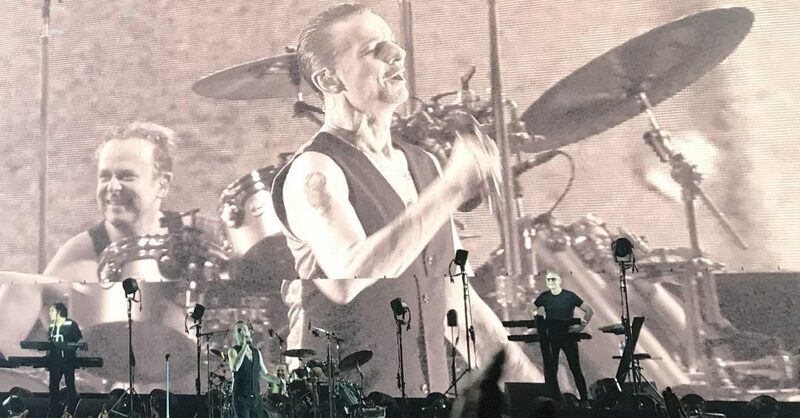 As Gahan laments how as a society we are “armed with new technology”, thousands of mobile cameras are in the air and he himself pouts and preens and grins for them all. This is what makes Depeche Mode such a fascinating and joyous band – they pull in different directions, both musically and lyrically (Going Backwards, the magnificent In Your Room or Barrel Of A Gun do not feel like they’re created by the same band as the one that made, say, Precious, Strangelove or Stripped); they ignite moods and reactions in people who fail to be moved, one suspects, in similar ways by much else. In the O2, fans are bordering on the riotous at various points. A Pain That I’m Used To has become a brilliant live song during this tour and sees large sections of the standing area merrily bouncing around. It also showcases the bass playing skills of the often unfairly maligned Gordeno, who follows up immediately with similarly excellent fretwork on Useless, complete with a new Subterranean Homesick Blues-style video. The contradictions continue… and crowd loves it. Cover Me may not make it to another tour in the future, but it’s become one of the finest moments on Spirit and on the accompanying tour. Gahan, lest we forget, is 55 years old, yet the yoga (apparently), clean lifestyle and positive attitude to performance means he does things on stage for two hours that people half his age would struggle to do once a week, let alone three or four times in the space of seven days. The cliches in the media are endless (“lounge lizard” seems to be a particular favourite this tour), but he defies his years with energy and a presence that are unmatched. Something has happened to Martin Gore, too – he seems so much more comfortable and at ease in a sober skin than his brooding, often glum-looking younger self. Perhaps it’s also recent fatherhood (x2) and an acknowledgement that through his songwriting it’s actually okay to have been an important part of so many people’s musical history. The odd juxtaposition of the live show versus the lyrical intensity of the songs is everywhere. Where’s The Revolution is an apparent call to arms to end the troubles of the world, for sure, but here at the O2 it’s just another opportunity to sing as a unit, to vocally share with thousands of others what it means to be part of something else – a movement of people utterly devoted to a single entity. This is no more apparent with the gloriously reworked Everything Counts, which pokes in the ribs of those who “grab all they can” but triggers a terrific sing-along at the end. Gahan, Gore and Andy Fletcher are no longer three blokes from Basildon (one of those other cliches), pioneering their form of synth music and trying to gain acceptance from their detractors. They moved beyond all that many years ago (not least with two of them living nowhere near their home-town). Depeche Mode are entertainers, obviously, but they are more than that. Gore said recently that the fervour from the fans and the community that surrounds them is almost religious in nature. He’s not wrong. And perhaps for the first time, fans at the O2, in the often low-key capital city of their birth country, stood up and worshipped with an intensity that perhaps they’d been meaning to demonstrate for many years. 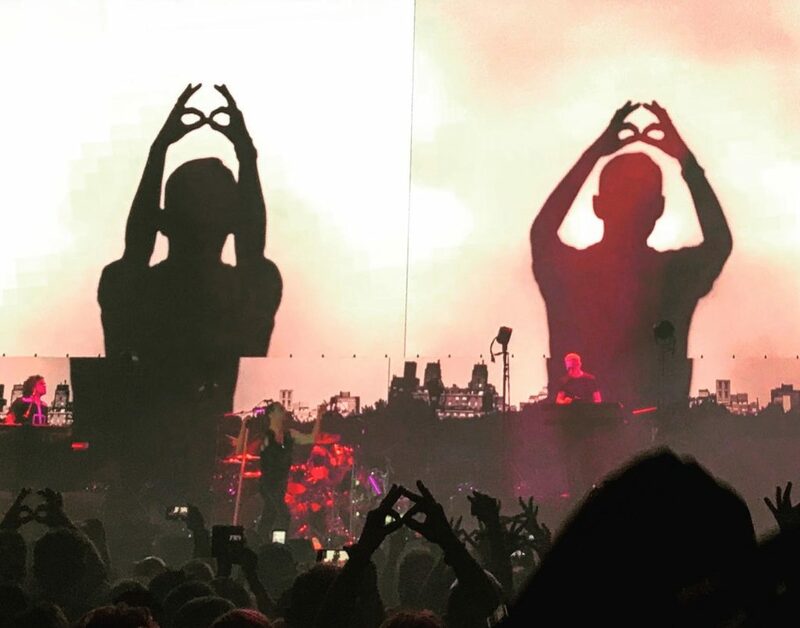 The national and global mood can be fairly sombre to many, but somehow, Depeche Mode provide a form of escapism for thousands of people. I have read on many occasions that Depeche Mode strike a chord with those that feel as if they are not part of the mainstream, whether that’s at a cultural or emotional level – Music For The Misfits, perhaps. 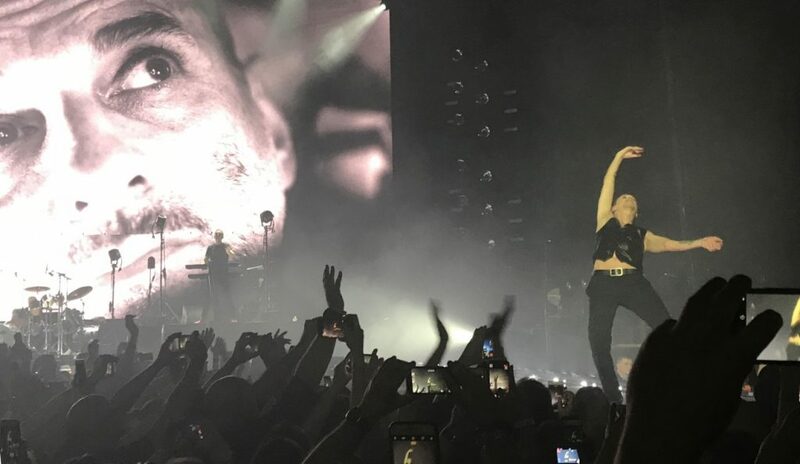 As the final two songs of the evening (A Question Of Time and Personal Jesus) play out, there’s the last chance to feel part of the Depeche machine, swaying and waving and bellowing out the words, before filing out to their normal lives once more. This odd, uplifting but sometimes dour, thoughtful, inspiring and confusing band, who really can’t be pigeon-holed musically because they’ve been so varied in their output over many years, have brought their array of contradictions to the masses again. If Depeche Mode stick to their now well-trodden strategy, Gahan, Gore and Fletcher will be entering their fifth decade as a group when they embark on their next tour. It was the best I’ve ever seen them and I’ve been there since almost the beginning (12th May 1981 The Venue, London), I was at the RAH and that was brilliant but this was something else. I still get goosebumps thinking about it- and it was 5th time on this tour. @angela – glad you enjoyed the gig! Such a wonderful review! I read it twice. @kay – thank you very much!